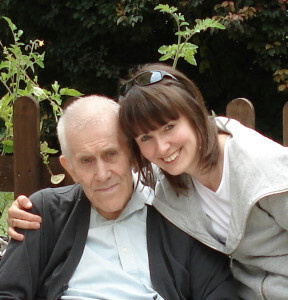 Beth and her dad who had vascular dementia. Beth is a campaigner, consultant, writer and blogger specialising in issues affecting older people, health and social care and specifically dementia. Today Beth talks about living positively with dementia and the important role Admiral Nursing plays in post-diagnostic care for families. For many years the focus around dementia has been on diagnosis, which whilst important has often neglected to be joined up with the post-diagnostic support that is absolutely vital to enable people who have dementia and their families to live as well as possible. My dad had vascular dementia for nineteen years, so I know only too well the ups and downs associated with diagnosis and what comes afterwards, or in our case, what didn’t come afterwards. My dearest wish for families today who are in the same position that we were in all those years ago is to have better support, increased knowledge and understanding, and to feel empowered and more able to cope. All of this is possible, and having a positive outlook is the first step towards making that happen. The historical message that a dementia diagnosis is a death sentence – where family life stops the moment the diagnosis is given – must change, and change quickly. That’s not to say that living with dementia is easy, but there is a huge amount of good practice, and many inspiring personal stories, positive interventions and coping strategies that can be learnt from, and shared amongst, people who are living with dementia and their families. When I think back to my dad’s years with dementia, I can honestly say that I learnt more about life, humanity and the value of simplicity in those years than any other life experience I’ve had has taught me. Some of the simple things we enjoyed together when conversation became more sparse included music, favourite foods and drinks, and the chance to pamper dad during his personal care. Undoubtedly our lives changed immeasurably because of dad’s dementia, and I’d be the first to admit that I missed having a father in the way that most conventional father-daughter relationships evolve over the years. But I still found moments of great joy with dad, and smiles, hugs and odd words came to have a much more deep and profound meaning than they might otherwise have had. I consider myself very lucky to have been able to adapt, cope (as best I could) and treasure those special moments when they came along, but many families need additional guidance and support in order to make sense of their own feelings, recognise how to provide positive support and to live in the moment. This is where Admiral Nursing can really come into its own. Sadly we never had access to an Admiral Nurse as a family, but given the knowledge I now have of what Admiral Nurses offer, and the accounts I’ve heard from families who’ve had access to them, they are a hugely important resource and one that is greatly undervalued. In my opinion, every family should have access to an Admiral Nurse. With better support for families and family carers, more people with dementia could be living well, and crucially from the perspective of policy makers, drawing less on already overstretched social care and NHS resources. But this is about more than monetary values – it’s about humanity, it’s about offering the care and support that families are crying out for, and it’s about kindness and compassion. If we truly want to be a country that offers the best dementia care in the world, post-diagnostic support that incorporates access to an Admiral Nurse is an absolutely essential element of that.